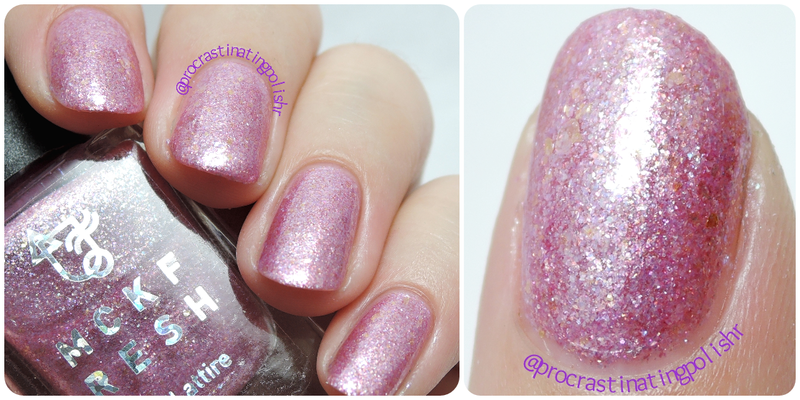 I have a whole lotta shimmery delights for you today courtesy of Mckfresh Nail Attire. Kate has been cranking out the collections already this year, and I've been lucky enough to swatch them all so far for your viewing pleasure. 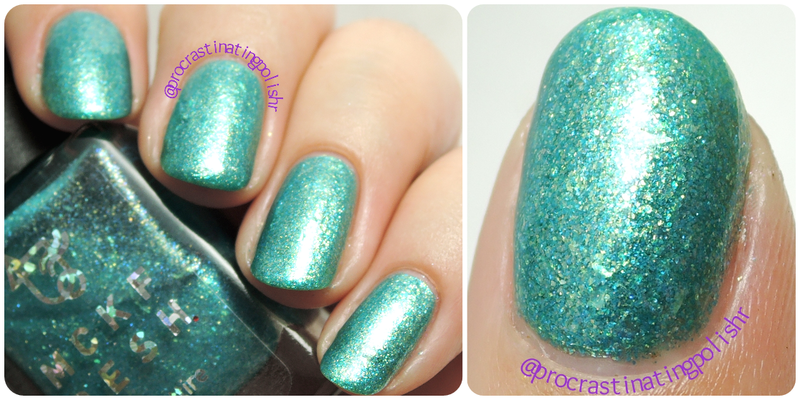 Today I bring you the Mermaid Lagoon collection, inspired by Mermaid Lagoon attraction at Tokyo DisneySea. Mermaid Lagoon is essentially the theme park home of The Little Mermaid. Does this not look like the most amazing theme park attraction ever?!? Gah, I love it! I want to live there! But, I digress. Let's look at some polish! 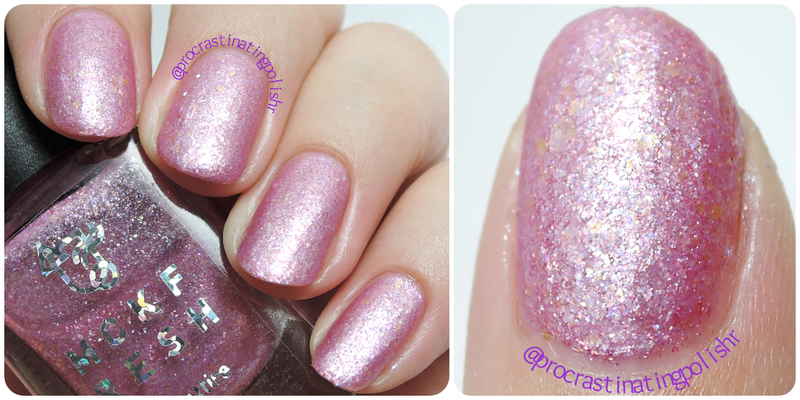 A shimmering lavender base with gold and pale pink flakies. The shimmer is super flashy, which makes this appear a little frostier in photos than it actually is - it also made it hard to get a colour accurate photo but the closeups give you a good idea. I felt like this polish was a little too Disney Princess for me, which makes sense given the inspiration for the collection! Formula was good, needing only two coats for opacity. Even with the abundance of flakies it applies really nicely, though if you have very ridgey nails like I do you may find it settles a little. The polish looks really complex with the flakies peeking through the colour and shimmer, and a matte top coat (below) enhances it beautifully. 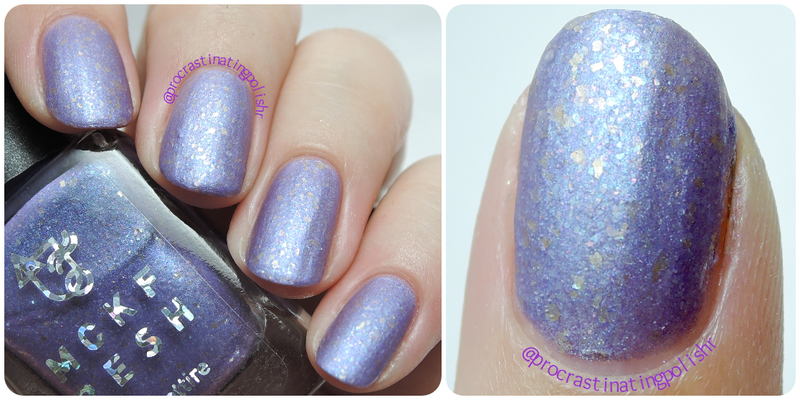 There is a really nice blue shift in the shimmer that makes me forgive the princessy feel a little bit. A fairy floss/bubblegum pink with gold and pink flakies. Another incredibly flashy finish on this one, it's almost like every little particle reflects the light giving this a luminous appearance. Once again, the closeups are more colour accurate. This has a slightly sheer base so I needed 3 coats for opacity, but application was a breeze and the finish was very smooth. I think this would work really nicely over a matching base coat if you're just looking for a more subtle kind of flash. Because of the mega sparkliness I prefer this matte, even though there isn't a great difference. When glossy it has too much flash and can look a bit too frosty for my taste, but the matte top coat refines it all and lets you see the flakes. 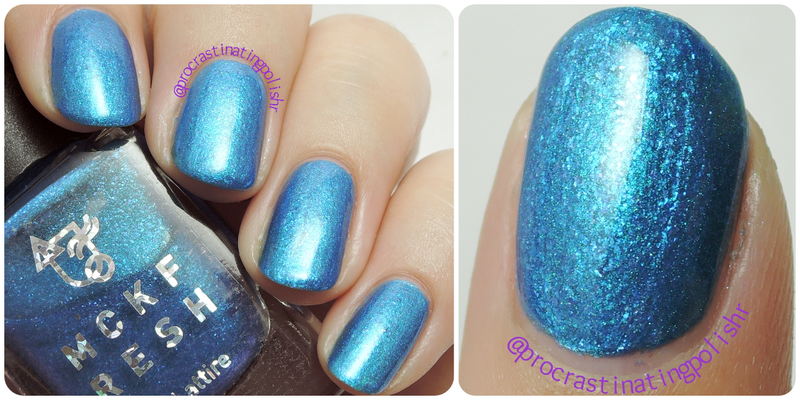 A cold electric blue micro flakie shimmer. I think the shimmer really works with this blue. At first I was disappointed that it wasn't quite the vivid royal blue it appears in the bottle but I soon came around to loving the icy appearance the shimmer gives. 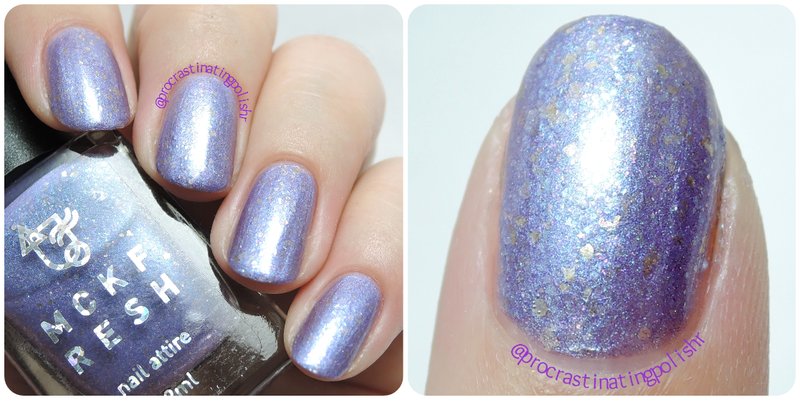 The micro flakies give a really subtle crinkled foil finish that is just like bubbling water. The base is quite sheer but builds up easily in 3 coats. The formula is the thinnest of the collection but it was still easy to work with, no flooding or mess to worry about. I did try this matte but I wouldn't recommend it, leave that beautiful frozen glass finish just as it is. A vivid watermelon with clear/green flakies. It's almost imperceptible, but the flakies are green! 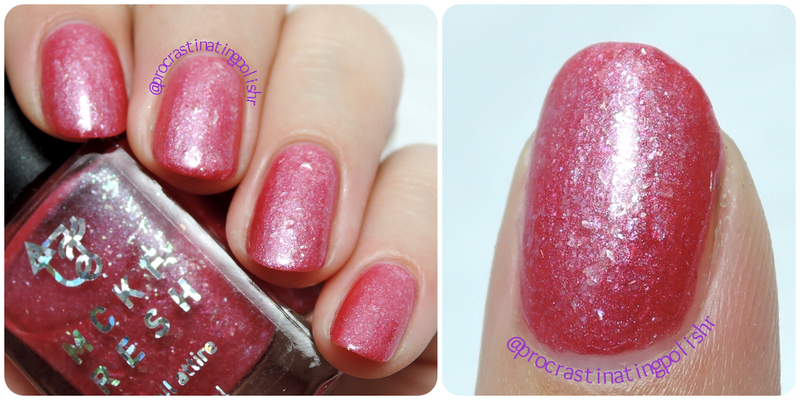 This is one of my favourites of the collection, maybe because it looks like a crushed Watermelon Chupa Chup. The colour is gorgeous and the cool green and blue tones that the flakies provide is a nice contrast. This is a nice rich colour only needing two coats for opacity. It is quite dense with flakies and glass fleck but applies well. I did have one flakie not want to sit right but I feel like maybe that was an anomaly as the formula was rich and lovely to work with. Check out how stunning this is with matte top coat - all the complexities shine through and lighten the look. I'm at a loss to why I didn't get a closeup! 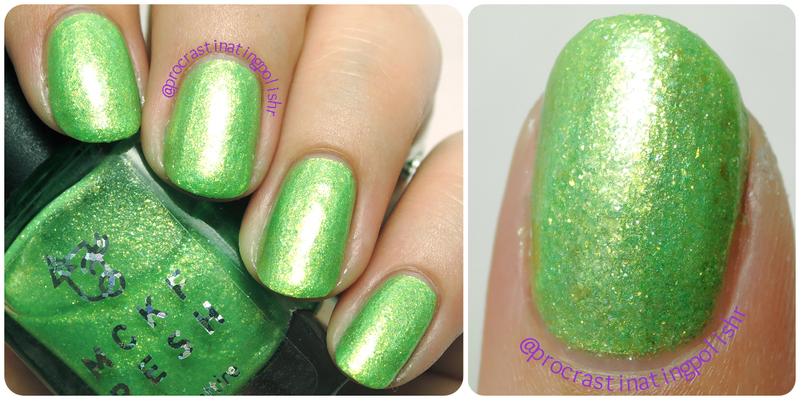 A vivid lime green with golden shimmer and flakies. Similar to Life is ze Bubbles but with added flakies and a warm golden shine. I love how summery and sunny this looks, the intensely reflective shine isn't as daunting in a colour I adore. This is a borderline 2/3 coater - I used three for my swatches just to be safe but those with short nails (or a disinterest in scrutinising their nails from centimetres away) can easily get away with two. The formula was again really easy to work with. I did try this matte and while I preferred it glossy it does look nice matte. You can see a wider spectrum of colour matte but I still really like the sunny glossy version. A rich teal and gold micro flakie jelly. 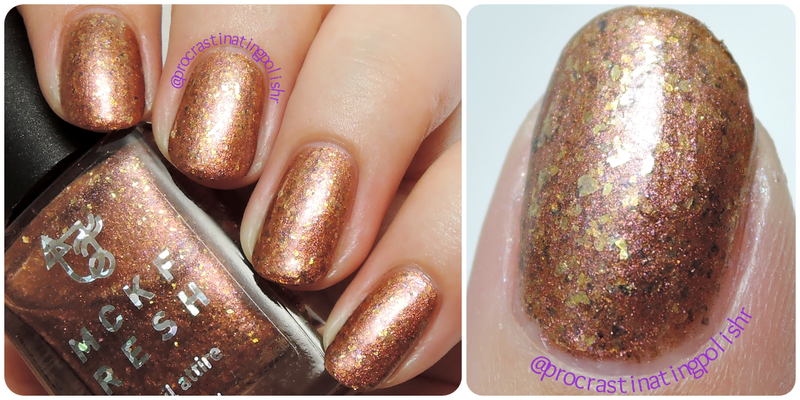 Gorgeous colour with just the right amount of gold, there is a nice depth about this polish. Of course being a lover of anything remotely green I am predisposed to love this, and despite owning approximately 3 billion teals this is still unique to my collection. The formula was beautiful and smooth, though I did get some balding in my impatience to apply a second coat so make sure you wait. The base is a sheer tinted jelly, which needs 3 coats for opacity. I'd also recommend wrapping your tips, as jellies can sometimes have that pullback effect that looks like tipwear. I absolutely adore this one matte. It takes on a bluer hue and gives off a bit of a coral reef vibe with the individual particles shining through. The closeups are again more colour accurate than the full swatch images. 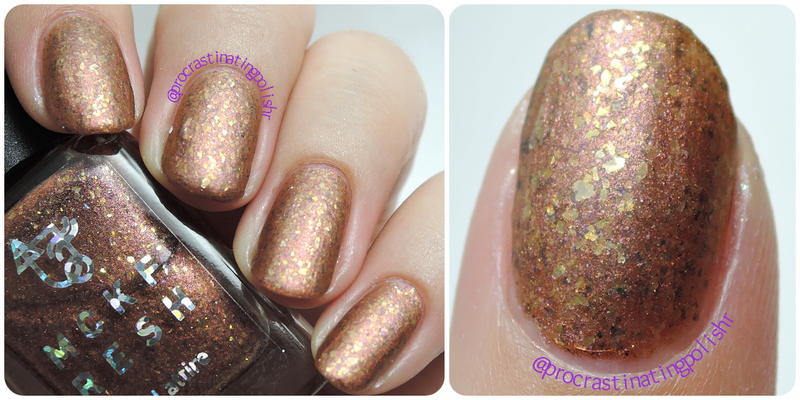 A coppery mocha with gold flakies and violet shimmer. I almost jumped for joy when I saw there was a brown in the collection and knew that it was going to be a favourite as soon as I started applying it. The golden glow can make this appear brighter and lighter than it truly is - it's a bit of a chameleon. I did three coats for opacity, and the formula was perfection. The finish is super smooth while giving great depth. I would recommend wrapping tips with this one as well, the contrast against my free edge was quite stark even though it didn't have the pullback I described above. I think I lost my marbles a little when I put on the matte top coat - I couldn't stop staring and inspecting, the complexity of the flakes and shimmer was just incredible. It has a really cool corkboard effect when matte that looks soft and velvety that I am head over heels for. What do you think? I think Kate did a great job of capturing the colours of Mermaid Lagoon, and even though I didn't love them all there is definitely something to appeal to anyone with such a wide range of colours and unique finishes. 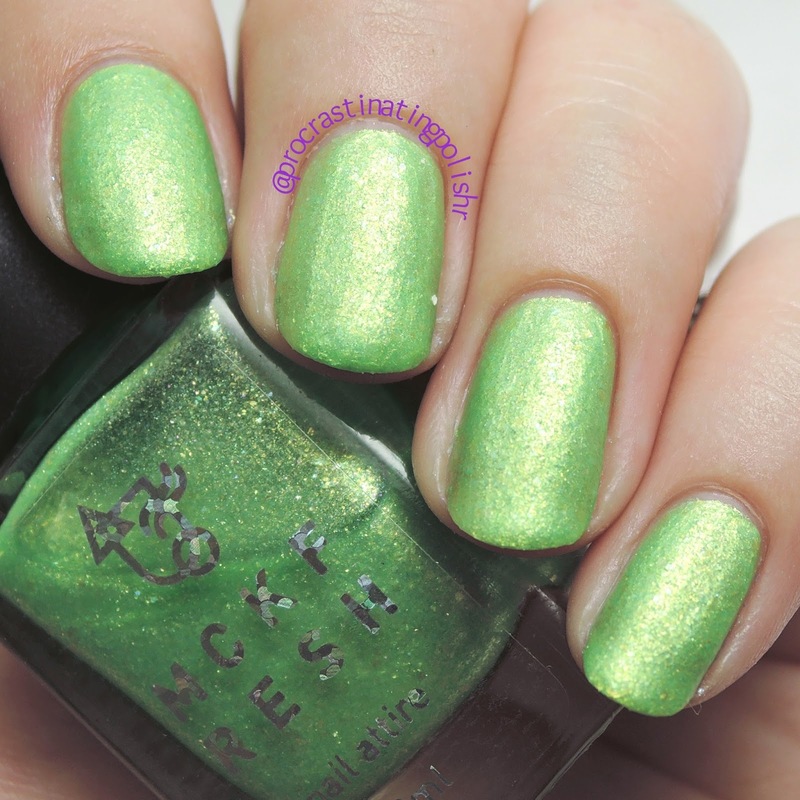 The Mermaid Lagoon polishes are available now via Mckfresh Nail Attire for $10 each.